Accordion-style notes pop up one after another for easy, one-handed dispensing. Perfect for reminders and short to-do lists. 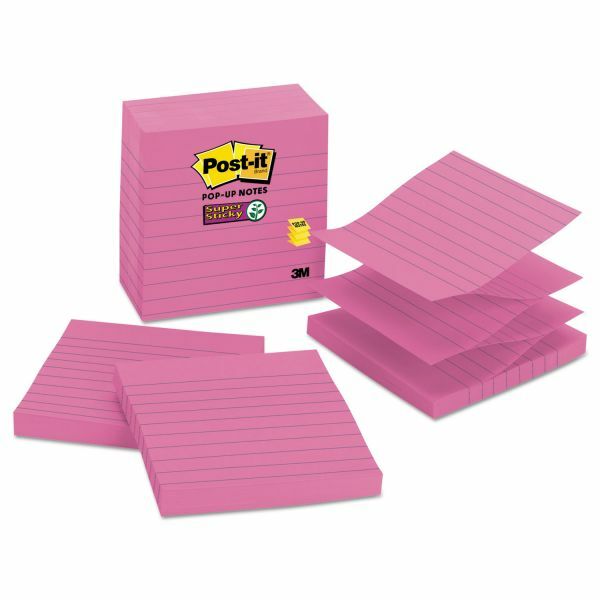 Post-it Pop-up Notes Super Sticky Pop-up Notes Refill, Lined, 4 x 4, Mulberry, 90-Sheet, 5/Pack - Post-it Super Sticky Pop-up Notes stick practically anywhere. Revolutionary adhesive technology ensures your notes will stick securely to more surfaces. Stick your notes where they'll really get noticed like monitors, doors and walls. Pop-up feature offers the convenience of grabbing just one note, with just one hand. The accordion-style notes pop up one at a time from a specially designed Pop-up dispenser (sold separately), keeping the notes at your fingertips. Lined so you can make neater notes. Paper used comes from well-managed forests where trees are replanted. 90 sheets per pad.